An electron microscope image of a micron-sized supernova silicon carbide, SiC, stardust grain (lower right) extracted from a primitive meteorite. Such grains originated more than 4.6 billion years ago in the ashes of Type II supernovae, typified here by a Hubble Space Telescope image of the Crab Nebula, the remnant of a supernova explosion in 1054. Laboratory analysis of such tiny dust grains provides unique information on these massive stellar explosions. (1 μm is one millionth of a meter.) Image credits: NASA and Larry Nittler. Dust is everywhere–not just in your attic or under your bed, but also in outer space. To astronomers, dust can be a nuisance by blocking the light of distant stars, or it can be a tool to study the history of our universe, galaxy, and Solar System. For example, astronomers have been trying to explain why some recently discovered distant, but young, galaxies contain massive amounts of dust. These observations indicate that type II supernovae–explosions of stars more than ten times as massive as the Sun–produce copious amounts of dust, but how and when they do so is not well understood. New work from a team of Carnegie cosmochemists published by Science Advances reports analyses of carbon-rich dust grains extracted from meteorites that show that these grains formed in the outflows from one or more type II supernovae more than two years after the progenitor stars exploded. This dust was then blown into space to be eventually incorporated into new stellar systems, including in this case, our own. The researchers–led by postdoctoral researcher Nan Liu, along with Larry Nittler, Conel Alexander, and Jianhua Wang of Carnegie’s Department of Terrestrial Magnetism–came to their conclusion not by studying supernovae with telescopes. Rather, they analyzed microscopic silicon carbide, SiC, dust grains that formed in supernovae more than 4.6 billion years ago and were trapped in meteorites as our Solar System formed from the ashes of the galaxy’s previous generations of stars. Some meteorites have been known for decades to contain a record of the original building blocks of the Solar System, including stardust grains that formed in prior generations of stars. For this study, the team set out to investigate the timing of supernova dust formation by measuring isotopes–versions of elements with the same number of protons but different numbers of neutrons–in rare presolar silicon carbide grains with compositions indicating that they formed in type II supernovae. Certain isotopes enable scientists to establish a time frame for cosmic events because they are radioactive. In these instances, the number of neutrons present in the isotope make it unstable. To gain stability, it releases energetic particles in a way that alters the number of protons and neutrons, transmuting it into a different element. The Carnegie team focused on a rare isotope of titanium, titanium-49, because this isotope is the product of radioactive decay of vanadium-49 which is produced during supernova explosions and transmutes into titanium-49 with a half-life of 330 days. 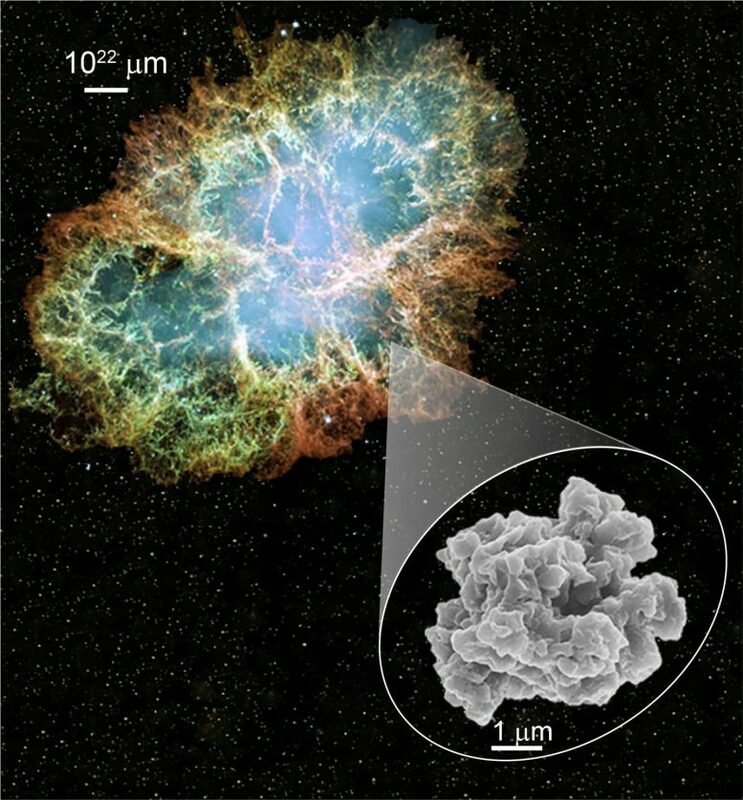 How much titanium-49 gets incorporated into a supernova dust grain thus depends on when the grain forms after the explosion. Using a state-of-the-art mass spectrometer to measure the titanium isotopes in supernova SiC grains with much better precision than could be accomplished by previous studies, the team found that the grains must have formed at least two years after their massive parent stars exploded. Because presolar supernova graphite grains are isotopically similar in many ways to the SiC grains, the team also argues that the delayed formation timing applies generally to carbon-rich supernova dust, in line with some recent theoretical calculations. Be the first to comment on "Carbon-Rich Stardust Grains Unlock Astrophysical Mysteries"